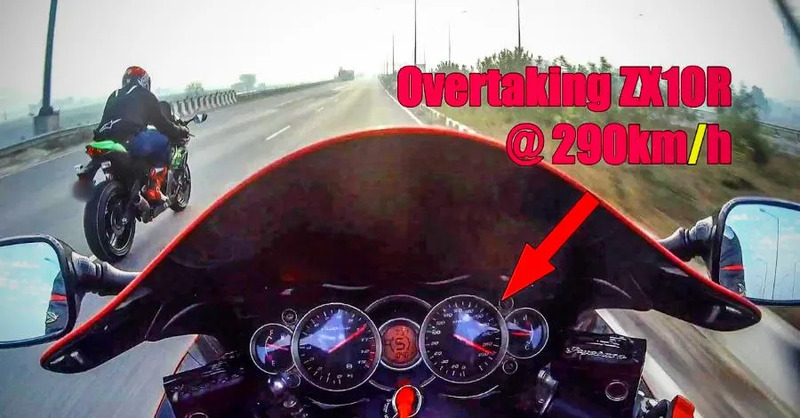 Suzuki Hayabusa vs Kawasaki Ninja ZX10R at 290 Kph on an Indian highway is INSANITY! Suzuki Hayabusa is undoubtedly one of the most popular sports bikes in India and is also very common on the Indian roads. The Hayabusa is not an outright sports bike but it is a sports-touring motorcycle that is designed to gulp miles on the highways while keeping the rider comfortable. The 1,340cc, inline four-cylinder engine powered Hayabusa is extremely powerful and can cross more than 100 km/h in the first gear itself. But what happens when it starts going against a Kawasaki Ninja ZX-10R? Well, here is a video byTurbo Xtreme, which shows the insane speed of Hayabusa and ZX-10R on the Indian roads. The video was shot on the Kundli-Manesar-Palwal Expressway, which is a newly made six-lane highway that bypasses the traffic from Delhi. It is a group ride done by a group of superbike owners and there are quite a few of them. The Suzuki Hayabusa starts chasing the Kawasaki Ninja ZX-10R when the roads open up and the video taken from the helmet-mounted camera shows how insane it can get. The Suzuki Hayabusa can be seen following the Kawasaki Ninja ZX-10R through the traffic closely. This is when all the sports bikes fall back and they do not get engaged in the high-speed run. The Hayabusa can be seen in pursuit of the ZX-10R and keeps on trying and the video later shows that the Suzuki Hayabusa finally overtakes the Kawasaki Ninja ZX-10R when the speedometer indicates more than 290 km/h of speed. It should be noted that the Kawasaki Ninja ZX-10R is a track-focused bike, unlike Suzuki Hayabusa which is powered by a much-relaxed engine. The ZX-10R can a higher rev-limit is also much louder than the Hayabusa on the road. The Suzuki Hayabusa is powered by an in-line four-cylinder, 1,340cc liquid-cooled engine that produces a maximum power of 197 Bhp of maximum power at 9,500 rpm and peak torque of 155 Nm at 7,200 rpm. The bike gets a 6-speed transmission. The Kawasaki Ninja ZX-10R gets powered by 998cc, inline four-cylinder engine that generates a maximum power of 197.3 Bhp at 13,000 rpm and a peak torque of 113.5 Nm at 11,500 rpm. Both the bikes have an electronically limited top speed of 299 km/h due to safety reasons. Should you be doing it? Speeding on public highways is always extremely dangerous. The channel mentions at the start of the video that he is highly trained and has an experience of riding superbikes for more than 20 years, which is a lot. However, even experience and training can go wrong at high speeds on the Indian roads. Speeding should be restricted to the tracks for everyone’s safety. Some may argue that even tracks are not safe and crashes keep on happening all the time on the tracks. Well, that’s true but racing tracks provide a much more controlled area than on the public roads. The risk of crashing inside a track is much lower due to the absence of public traffic and stray animals. Also, tracks are designed to absorb the impact of the crash and to save the riders or drivers from fatal injuries. Most of the tracks also provide medical treatment that can be crucial during the initial time after the accident. It is always a good idea to do the speed runs inside a controlled area rather than the public roads.